By now you've probably had your fill of sugar cookies, rum balls, and other holiday sweets that have been lurking around your home and office. It's time to give your sweet tooth a break and sample some savory fare! Whether you're hosting a Hanukkah, Christmas, or New Year's Eve bash, or just want to be prepared in case unexpected guests drop by, you'll want to have foolproof appetizer ideas on hand. The nibbles below all come from well-known chefs who also love to entertain at home. Don't be intimidated—I've tried all of them and they're a cinch to pull off. That doesn't mean you can't still brag to your friends about the complexity of the flavors and all your hard work in the kitchen. Andrew Carmellini is a James Beard–award-winning chef, who has previously cooked at such well-regarded establishments as Café Boulud and A Voce. He's the author of a wonderful new book called Urban Italian. Here's his recipe for Sheep's Milk Ricotta and Country Bread, which Carmellini guarantees you won't be able to stop eating. Using a stand mixer or a whisk, beat 2 cups Sardinian sheep's milk ricotta (if you can't find this, use regular cow's milk ricotta) with 1 cup milk until the mixture is light and fluffy. Add 1 teaspoon of table salt. Transfer the mixture to a serving bowl and sprinkle the top with 1 teaspoon each: fleur de sel (or sea salt), coarsely ground black pepper, fresh thyme leaves, and 1 tablespoon dried oregano. Drizzle with a couple of tablespoons of extra-virgin olive oil. Serve with Grilled Country Bread. If you have a grill, preheat it to the highest setting, or put your oven on broil and set the rack on the highest level. Cut 1 loaf Italian bread (ciabatta or semolina) into 1-inch thick slices. Drizzle both sides with olive oil and sprinkle with salt and pepper. Grill the bread (on the grill or under the broiler) until it's charcoal-colored on the edges. Turn it and do the same on the other side. Using tongs, pull the bread off the grill and rub it on both sides with a crushed garlic clove. Serve warm. You may have seen spunky Chef Alex Guarnaschelli on Food Network's The Cooking Loft, or witnessed her judging talents on Iron Chef. But really what she excels at is amazing food. Here are two of her go-to dishes for last minute entertaining. Layer Brie in between pieces of toasted rye bread. Cook them like a grilled cheese in a skillet with 1 tablespoon olive oil (you can also toast these sandwiches and cut into wedges). Serve with a dollop of pesto. You can use store bought, or try Alex's recipe: rosemary, spinach, olive oil, salt, pepper, and lemon juice. Mix together thinly sliced dried figs, grated lemon zest, and 1 tablespoon olive oil in a small bowl. Spread a prebaked pizza dough with low-fat sour cream. Top with crumbles of blue cheese and the lemon-fig mixture. Warm in a low oven for a few minutes so all the flavors meld together. Cut into wedges and serve. When Chef Michael Schlow has drop-in holiday guests, he puts together an impromptu Make Your Own Crostini party. It's super easy, and can be done with just an oven or toaster oven. Drizzle small rounds of bread with extra-virgin olive oil. Put the warm bread out on a platter and surround it with small bowls filled with any of the following toppings. Then just tell your guests to help themselves. Honeyed Beets: In a bowl, sprinkle cooked, chopped beets with thyme, honey, olive oil, and salt and pepper, and mix. Sprinkle a little goat cheese on top and serve. Olive Tapenade: You can either buy it, or simply combine pitted olives in a food processor with a little olive oil. Broccoli Rabe: Sauté broccoli rabe with extra-virgin olive oil, a few slices of garlic, salt, and crushed red pepper. Chop coarsely, place in bowl (can be served at room temperature), and then sprinkle some shaved Parmigiano over the top. Chickpea and Shrimp Salad: Take cooked chickpeas (canned are fine) and cooked, peeled shrimp and chop into fairly small pieces (just so they can stay on the bread). Mix with sliced red onion, lemon, extra-virgin olive oil, salt, pepper, parsley, and place in bowl. Served chilled. And finally, for the idea that is so easy, even kitchen idiots can't mess it up, I give you Cat Cora's Gorgonzola-Stuffed Figs. Yes, Cat is that amazingly fit chef beating all the guys on Iron Chef America. She totally rocks. Preheat the oven to 375º. 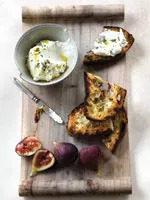 Slice figs (fresh or dried—whatever you can find) in half and fill the center with 1/2 tablespoon of Gorgonzola. Arrange on a baking sheet, cut side up, and sprinkle with 2 tablespoons balsamic vinegar, 2 teaspoons of salt, and pepper to taste. Bake in the oven until cheese begins to melt, about 2–3 minutes. Crumble a little more Gorgonzola on top before serving, if desired.